Alan Cohen has had record setting times and continues to win multiple awards at events nationwide. Alan has participated in an extensive array of events with NASA, NARRA, and EMRA, as well as participated in the Cadillac Challenge on the West Coast. Alan has substantially beaten best personal times from prior seasons at New Jersey Motorsports Park on Lightning and Thunderbolt, Lime Rock Park, Pocono, and Watkins Glen International. He has placed 1st and 2nd in his racing division, as well as overall at nearly every event he participates in with NASA Northeast. In addition, Alan placed 1st in the TTU Division for NASA Time Trials for the 2012 and 2013 seasons. During the 2015 race season, Alan competed primarily on the West Coast taking 1st in Rounds 2 and 4 of the Cadillac Challenge, as well as setting new track records for Fastest CTS-V at Buttonwillow, Sonoma Raceway, and Mazda Raceway Laguna Seca.He brings a fierce sense of competition to the track regardless of the event. 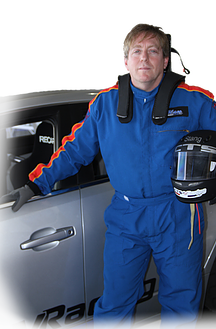 ​Integrating Alan's experiences with building a performance car and passion for racing, he has been able to extend his knowledge by becoming a National Certified Instructor for PCA for NASA Northeast and NARRA events, and look forward to instructing for EMRA and other car clubs. Alan Cohen has always been an enthusiast of fast cars, but it was not until early 2010 when he purchased his 2009 CTS-V Cadillac that his passion escalated further. Alan found himself at New Jersey Motorsports Park several times a month testing the performance of his car. Over the latter part of 2010, Alan wanted to find ways to get better time around the track and make corners faster- whether it was increasing horsepower or changing the suspension system. Through extensive internet research and seeking advice from other Cadillac enthusiasts, dealers and mechanics Alan initially opted to install several competition parts; all improving my time and handling of my stock track times exponentially, but as any avid track goer, he wanted more. Alan completed the installation of D3’s bolt-on racing package- increasing the horsepower and lowering the car, enabling improved speed around the track. In a need for a presence on the East Coast, CTS-V Racing, LLC established itself as a knowledgeable distributor of competition racing parts specifically for the Cadillac CTS-V, as well as an auto shop at our New York facility to install those parts by a GM Cadillac veteran with 30 years of experience. Our mission is to enable Cadillac owners in the Northeast access to a performance shop with the experience and professionalism deserved. 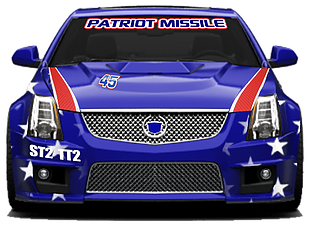 2009 CTS-V Sedan - The Patriot Missile. ​Many people think of the Cadillac CTS-V as a luxury car, but at CTS-V Racing, we have taken a stock 2009 CTS-V sedan and transformed it into a powerful performance machine for the race track. Competing in events nationwide, we continuously seek ways to enhance the performance and horsepower to showcase its maximum potential on track.